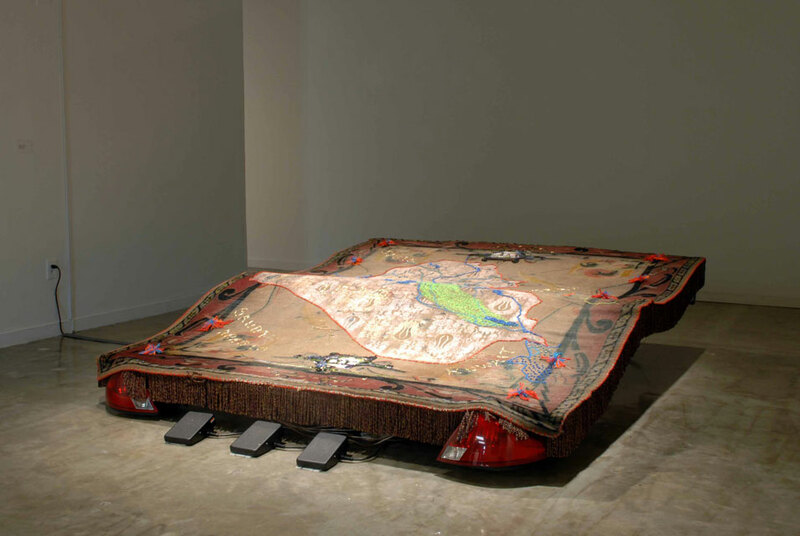 Artist Pip Brant has created a 'flying carpet' that can be controlled by foot pedals. The rug was found back in the early 1980's and has since been transformed with the addition of brass ornaments, wood, car parts and an electric motor. Through the use of the 3 pedals, the carpet moves and makes noises. According to Pip "...motorizing, embroidering and electrifying can bring this malady to a new level. The end result is an altitude of transformation that can no longer function as a useful item, and a ridiculous contraption that can evolve into ‘art'." The display will be on from September 4 to October 11 in the ArtCenter/South Florida at 800 Lincoln Road, Miami Beach. Cool idea, although we were really excited someone had actually come up with a way to fly around on carpets. Until then this will have to do. Detail Images of Pearl Carpet of Baroda: Rare Carpet to be AuctionedThe Pearl Carpet of Baroda will be going to the hammer this March 19, 2009 in Doha Qatar. Starting ...Flying Carpet ChairSo the title may be a bit misleading, as this chair definitely cannot fly nor is made out of a rug.Astronaut to Test Flying Carpet in SpaceAt a cost of nearly $15,300 per pound, our vote is the highly revered Silk Qom.